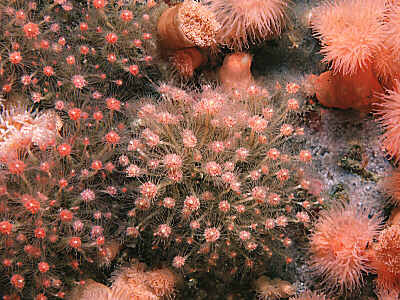 Description: This hydroid forms neat rounded masses of large pink polyps. The stems are tubular, with a yellowish coloured tegument and are branched at the base. The polyp colour is pale pink through to red, and consists of a central circlet of oral tentacles surrounded by paler but larger aboral tentacles. Overall height 40-60mm, diameter of the polyp and tentacles about 10mm. Habitat: This hydroid is usually found on rocks and attached to algae in moderate to strong tidal streams. It is commonest in shallow water, fouling piers and the undersides of boats, down to 25m or more in strong tidal streams. Distribution: Common throughout the British Isles. Similar Species: Tubularia indivisa can be difficult to distinguish from this species and the two often occur together. In Tubularia larynx the stems branch, while in Tubularia indivisa they are unbranched, though separate individuals settle on the stems of others forming irregular clumps. Large polyps with an outer ring and inner cluster of tentacles, borne singly at the tip of tubular stems. Stems form a branching mass at the base, producing neat, bushy colonies. Picton, B.E. & Morrow, C.C. (2016). Tubularia larynx Ellis & Solander, 1786. [In] Encyclopedia of Marine Life of Britain and Ireland.